Deploy Software Quickly and Painlessly with BatchPatch! When you are responsible for managing a large network of computers, one of the tasks you typically have to complete on a regular basis is installing or updating software on many or all of your machines. The problem is how do you accomplish this seemingly monumental task when you have dozens, hundreds, or even thousands of computers? At one point or another every administrator has had to painstakingly install or remove software from multiple computers, one by one, manually. Fortunately, the days of using remote desktop to manually install software on remote computers is over! With BatchPatch you can easily deploy software, updates, scripts, and patches to any number of computers, simultaneously, with just a few clicks, all from a single console. Software deployment is only one of the many features that BatchPatch has to offer. For the list of other features that are *not* related to software deployment, such as remote Windows Update, please visit the BatchPatch home page. Easily install Microsoft software as well as 3rd-party applications like Adobe Reader, Adobe Flash, Java, Firefox, Notepad++ etc. Whether it’s a first-time installation, an upgrade, or even an operating system service pack install, most applications can be deployed remotely, so long as they support a “silent” or “quiet” parameter. See the bottom of this page for more information on silent deployments along with a number of tutorials to guide you through typical software deployment scenarios with BatchPatch. IMPORTANT: In order to execute a remote installation with BatchPatch, you must first determine the proper command line switch/parameter to initiate a “silent” or “quiet” installation. A proper silent/quiet installation will complete without any user interaction, but if you execute an installation without specifying the correct silent/quiet parameter, the hidden remote process will hang indefinitely without ever completing. Different installation packages have different command line switches. The silent/quiet switch might be any one of the following, or something completely different, depending on how the installer was created: /S, /s, -S, -s, /silent, -silent, /Q, /q, -Q, -q, /quiet, -quiet. 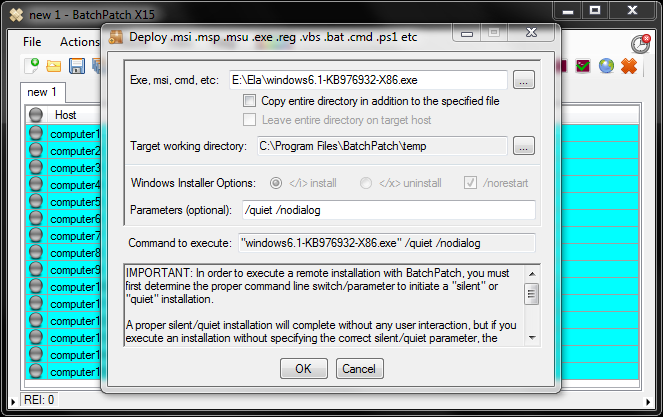 BatchPatch makes it easy to deploy standalone MSI, MSP, MSU, EXE, REG, VBS, PS1, CMD, BAT and virtually any other type of file to remote computers. The key here is to test on a single machine before attempting deployment on many computers. Remember that not all standalone patch files will support the same command line switches/options, so it’s up to you to test everything thoroughly before attempting a mass deployment. There isn’t really any limitation to what you can deploy, so if you’re not sure if BatchPatch can handle your file type, it probably can! Just give it a shot or contact us for assistance.